The undefeated season at home continues! For a refresher on what constitutes a Bell Ringer, please reference the initial post. Bell Ringer Season Standings: Joel Embiid – 5; Ben Simmons – 3; JJ Redick – 2; Robert Covington – 1; Dario Saric – 1. When the Sixers couldn’t buy a bucket for the majority of the fourth quarter, it was Embiid keeping the game from completely spinning out of control by consistently earning his way to the free throw line. Embiid scored the final 11 Sixers points in regulation, including the incredible jab step three to tie the game with 34 seconds remaining. He was a monster on the glass, and I don’t think Malik Monk is going to be trying to score on JoJo for at least the next few years, after the big man sent one of Monk’s shot attempts all the way back to Kentucky. It’s his second 40-point game of the season. Those MVP chants from the Wells Fargo Center crowd don’t even feel like homerism; they feel like the truth. 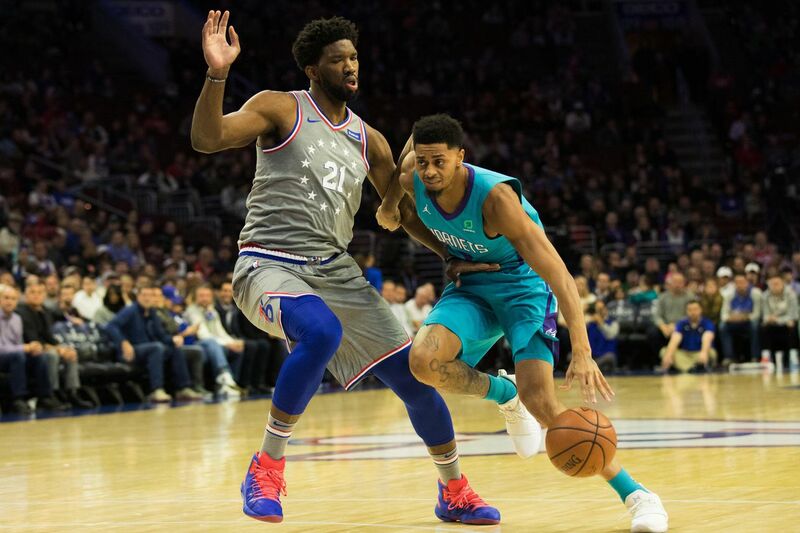 The Sixers ultimately needed every inch of their point guard’s 6’10” frame, as Simmons closed out hard and got a hand on Kemba Walker’s potential game-tying three with 17 seconds left in overtime. Simmons even showed his great defensive awareness to hurry over and contest Miles Bridges’ attempt as well. All game long, Ben was aggressive in attacking the rim, showing off some fancy finishes and a bushel of dunks. The 13 assists were a season-high. Simmons looking to get the ball out of his hands as quickly as possible when it looked like Charlotte might foul towards the end of the game was eyebrow-raising, but on the whole, terrific two-way game from last year’s Rookie of the Year. Not a great offensive night for Covington, but he was every bit of a First Team All-Defense standout on the other end against Charlotte. The blocks will stand out on the stat sheet, but he also played some exemplary defense against Kemba Walker down the stretch, including on the final Hornets possession of regulation when Kemba could have won the game. Impressively, Covington did it all with 5 fouls for a good chunk of the game. He also masterfully knocked the ball off the opposing player’s knee on a couple drives to create turnovers. Little things like that don’t show up in a box score, but make a huge difference in the game. Saric continued to put his shooting struggles behind him, knocking down 4 of his 8 three-point attempts. He also had a nice foul line jumper and a couple savvy cuts to the hoop. Dario did struggle with 5 turnovers and had a really costly foul on Malik Monk for a three-point play in overtime. Is there anything better than that Homie doing his Homie celebrations? Chandler still doesn’t have the green light to play extended minutes, but this was his first strong performance as a member of the Sixers. He knocked down a pair of threes, rebounded the ball well as part of some smaller lineups, and displayed the ability to switch liberally on defense. Chandler will definitely help the rotation once he’s able to go for more than 15 or so minutes per night.